Computer Ergonomics is about things that you can do to make working on a computer more comfortable and better for your body. For example, wearing a bike helmet when riding a bike and a seatbelt when riding in a car are two simple things that you do to be safe and injury free. Posture. No one posture is perfect. You do not have to be “military” but getting comfortable is essential. Footrests help, (or a book or lunch pail or anything handy to rest your feet up a bit), as do cushions if your chair is not providing adequate support. The most important rule is to avoid prolonged positions. Shake your hands and shoulders now and then. Keep lose. Eyes. After good lighting and avoiding glare, the most important eye consideration is to look away from the screen occasionally. It really helps. Also, don’t forget to blink. Blinking moistens your eyes to prevent burning from dryness. Warm up. Just as an athlete prepares for the game by stretching and loosening the joints and muscles to prevent injury and enhance performance, you too should prepare for a marathon session surfing the Net. Do some shoulder rolls, neck stretches, wrist wiggles and leg stretches before you even log in. Prevention is better than repair. Breaks. If you hold any part of you in one position for longer than an hour, you set your self up for stiff joints, achy muscles, tendon fatigue and ligament weakness; not to mention decreased efficiency and diminished concentration. If you are focused on what you are doing, you can loose track of time unless you purposely schedule breaks. Have the computer clock on screen, or steal the oven timer out of your kitchen, or set the alarm on your watch, or somehow let yourself know about the passage of time. Then, at least once an hour, (every half hour would be better), get right up off your seat and walk around, stretch, yawn, wiggle, breath, get the blood flowing and stimulate the joints. It is worth the time and trouble as you will feel better, work sharper and get more done. Take advantage of un-scheduled “downtime”. Instead of staring at the little hour-glass and wishing it would go faster, do something beneficial for your body. 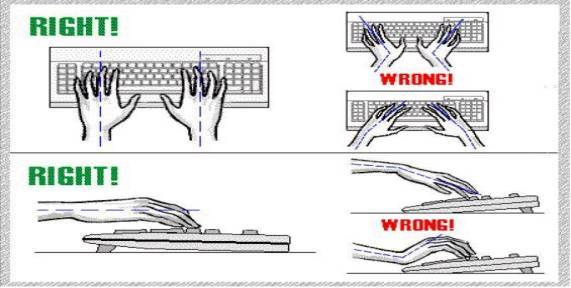 Keyboards Be sure to get the height right to prevent too much bend at your wrist and allow your forearm to have some support. Your arms should hang loose to prevent your shoulder muscles from cramping. Many keyboards can tilt; unfortunately, most of them tilt the wrong way. If any thing your keyboard should tilt to help your wrist stay straight, which is to say raising the space bar end and lowering the “top” (the F1, F2 etc.) end. Tilting the key board the other way, (space bar lower and “top” row higher) can set you up for carpel tunnel syndrome. If you already have mechanical body problems, such as neck arthritis or carpel tunnel syndrome, it is necessary to take breaks frequently; on the order of three or four mini-breaks per hour.